Whether you're looking for an adventure, are on a nature walk with your kids, or have a bum leg, there's no reason that you can't have the time of your life. Helen Georgia and its surrounding areas feature hikes for all skill levels and ability levels. In fact, hiking might as well be the state sport. Serious hikers can take on steep switchbacks ascending up hillsides while younger hikers can run and skip down paved paths. ADA accessible paths on some trails even make it possible for older or disabled hikers to participate as well. The gorgeous landscapes of North Georgia cannot be denied. 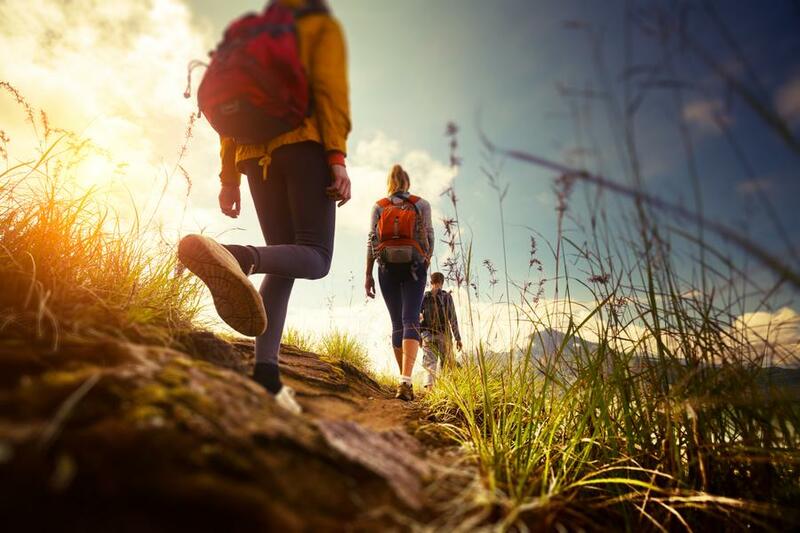 To ensure that your stay is as exciting and wonderful as possible, here’s an outline of our hiking guide to help you make the most of the hiking trails in and around the area. When was the last time you took a walk in the woods? Whether you’re a bona fide, card-carrying member of the American Audubon Society or you can’t tell a spruce tree from a tropical palm, almost everyone enjoys a leisurely stroll in the great outdoors. It’s a wonderful way to reawaken your mind and take stock of all of the beautiful, natural treasures around you each and every day. In our busy always-rushing-around lives, we rarely take time to truly stop and smell the roses – or the Georgia pines. However, when you force yourself to take a break and enjoy a quick trek outside, you will often find that the fresh air does wonders for your mood. 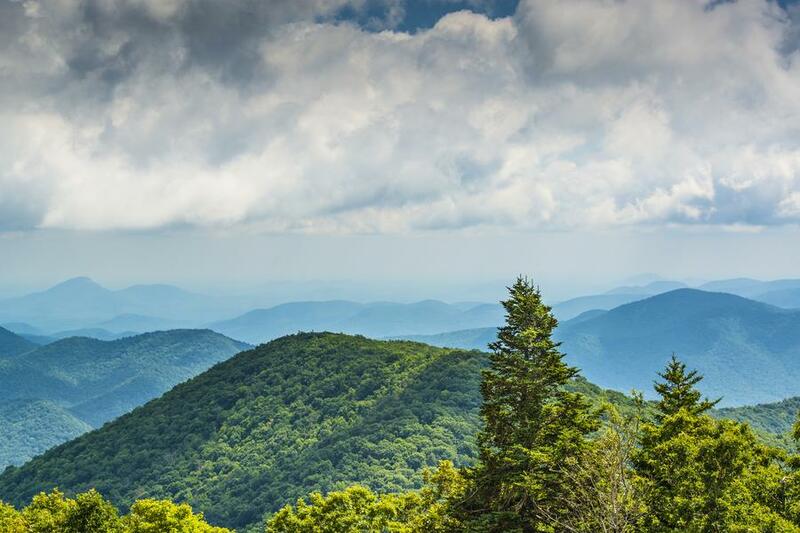 If you’ve ever been on a hike in the North Georgia mountains, then you know it’s an experience quite like no other – and that’s exactly why we have plenty of guests situated near some of the most beautiful national parks and breathtaking trails in the region. Imagine taking a quick morning run or a family afternoon stroll through the woodland and happening upon a magnificent waterfall, climb to a cliff overlooking a valley or maybe even cross paths with a family of deer. That’s exactly the sort of experience you can expect to have on the trails in North Georgia. You don’t have to travel very far to see beautiful sights. There are plenty of great trails just outside the back door. Additionally, whether you’re an experienced outdoorsman/outdoorswoman or a trail novice, there are plenty of opportunities. In fact, Helen also offers shorter and more family-friendly trails perfect for those who want to enjoy nature without exhausting every muscle. Ok, I’m In. Where Can I Go Hiking Around Helen Georgia? Beautiful North Georgia is a landscape full of wooded peaks beckoning visitors for a hiking adventure. When you chose to stay at a cabin on your North Georgia getaway, you have numerous hiking choices right outside your door. Are you hoping for a leisurely afternoon hike or a trail that requires more skill and stamina? No matter what kind of hike you're looking for, the mountains near Helen can provide you with an outdoor adventure. Here are a list and deep dive into all the areas we’ve curated for your outdoor walking expedition. With its natural beauty and a wide range of amenities, this is one of the most popular hotspots in all of Georgia. In addition to being a gateway to Anna Ruby Falls, this state park offers a variety of its own hiking opportunities, including a seven-mile bike trail. Located just outside of town, Unicoi State Park is home to several different hiking and mountain climbing trails. This variety ensures that there is the perfect hike for every visitor. The Frog Pond Nature Trail is a 1/3 mile loop and is perfect for beginning hikers or families with small children. The Lake Trail is longer but is mostly flat and is a great hike for viewing leaves in the fall. The Unicoi/Helen Trail is the most difficult hike at three miles one way. Here is our deep dive into all the trails Unicoi has to offer. This 1/3 mile loop in Unicoi State Park is a very easy-going hike that informs visitors of some of the natural features they may encounter on the walk with tree identification markers and interpretive signs. It is rated as an easy hike and highlights the wildlife of the North Georgia mountains. This is a moderate trail that winds around for 2 miles (approximately 1.5 hours to complete). This trail is formed of compacted soil and runs through the forest and over several streams. Therefore, you may want to make sure you bring proper shoes for the wet areas. This moderate hike provides truly gorgeous scenery as you pass through mountain laurels, hemlocks, rhododendrons, and other native flora. The path will also take you by the remains of an old historic homestead, as you cross several brooks and enjoy the sights and sounds of the hardwood forest around you. At last, the trail joins up with Smith Creek's rippling waters and takes you back to Unicoi Lodge. This moderate and sometimes challenging path will lead you three miles, one-way for a total of a six-mile round-trip hike. On this path, you will be able to hike from Unicoi State Park to Helen on an engaging trial that begins and Bottoms Loop Trail before continuing on through magnificent wildlife and woodsy scenery before crossing Lower Smith Creek. On your journey down this trail, you will also pass over multiple small streams and will end your journey at Unicoi Hill City Park in Helen. This trail is moderate to strenuous, so be sure to wear a good, strong pair of running shoes. The path offers stunning views, which are made even more magnificent if you make your trek during sunrise or sunset. Beginners may want to jump onto Lake Trail. This 2.5-mile loop is made up of compacted soil and a flat surface, making it an easy trail for those just starting out. The trail circles around the edge of the 53 acres Unicoi Lake. You'll get spectacular views of the lake itself as well as the mountains and trees surrounding it. In the fall this is the perfect trail for viewing the changing leaf colors while hiking near Helen Georgia. If you stop by the Visitor’s Center you can pick up a tree guide which will help you identify the trees present in the park. If you are looking for a strenuous run, then Smith Creek Trail may be just the right fit. It is a 4.8 mile one-way trail that runs through the Chattahoochee National Forest and ends at Anna Ruby Falls Recreation Area. The terrain can be rough in spots, so come prepared with heavy-duty running shoes. Hikers that plan on only going one way should plan ahead by leaving an additional vehicle at the end of the trail or arranging a shuttle. Please wear appropriate hiking shoes and clothing, and pack your own water and food. Unicoi State Park is full of opportunities for sightseeing and fitness through hiking. Helen locals and visitors alike love the trails at Unicoi for their close proximity to Helen's cabin rentals as well as its natural beauty. Most people familiar with Helen know about the amazing and rare double waterfall at Anna Ruby Falls in the Chattahoochee National Forest. Anna Ruby Falls forms just before two creeks — Curtis Creek and York Creek — merge together making this one of the more memorable waterfalls in northern Georgia. The trail is paved, making it ideal for those who aren't fond of rugged paths, or for individuals with handicaps. Ultimately, the trail will take you to two observation decks that will provide you with excellent views of the falls. If you're up for more of a challenge, you can also continue along the trail that proceeds deeper into Unicoi State Park. The sight of the falls during Autumn is all the more breathtaking. Anna Ruby Falls is also one of the more accessible falls. A short, half-mile footpath leads from the parking lot to the base of the falls. To get there from Helen, head north on Georgia 356 and turn onto Anna Ruby Falls Road. This is one of the easiest, trails in all of Helen Georgia. It is almost one of the most impressive due to the cascades of the Dukes and Davis Creeks coming together. The primary roaring waterfall is over 200 feet high and nearby, you'll find a series of smaller ones. The trail is well maintained making it a perfect visit for children, older adults and everyone in between. Three observation decks allow for the best views of this cascading waterfall. The 1.2-mile walk from the parking lot to Dukes Creek Falls takes you through the green ferns and deep forest of the Chattahoochee National Forest. It’s also close to nearby attractions including the Dukes Creek Mine and Smithgall Woods Recreation Area. The Dukes Creek Falls Recreation Area is located west of Helen on Georgia 358, the Richard B. Russell Scenic Highway. Looking for a challenging waterfall trail for hiking? Helen is a great starting point for the Raven Cliff Falls Trail. Situated northwest of Helen this trail follows Dodd Creek through the Raven Cliff Wilderness Area. This is an out and back trail with the turn around 2.5 miles from the trailhead. A total of five miles of hiking is highlighted by an abundance of bird life, beautiful expanses of wildflowers, and the Raven Cliff Falls at the turn around point. As you approach the Cliffs you'll first notice the noise before you actually can see the waterfall. The water flow is heaviest in the Spring months but the unique shape of the rocks produces strong falls through the year. This waterfall drops 30 feet into a plunge pool, passing through a huge block of granite split into two from centuries of erosion. Along the path, which follows Dodd Creek and winds through hemlock and rhododendron forest, you will also see several smaller falls making this hike well worth the effort if you're up to it. A variety of birds call this area home, not just ravens. Wild turkeys, grosbeaks, and even vireos can be seen on a regular basis. Halfway through the five-mile walk, you will come across a massive dark bluff. Be aware, however, that due to this bluff, along with a rugged trek, streams to cross, and steep grades, this trail is not for the faint of heart. 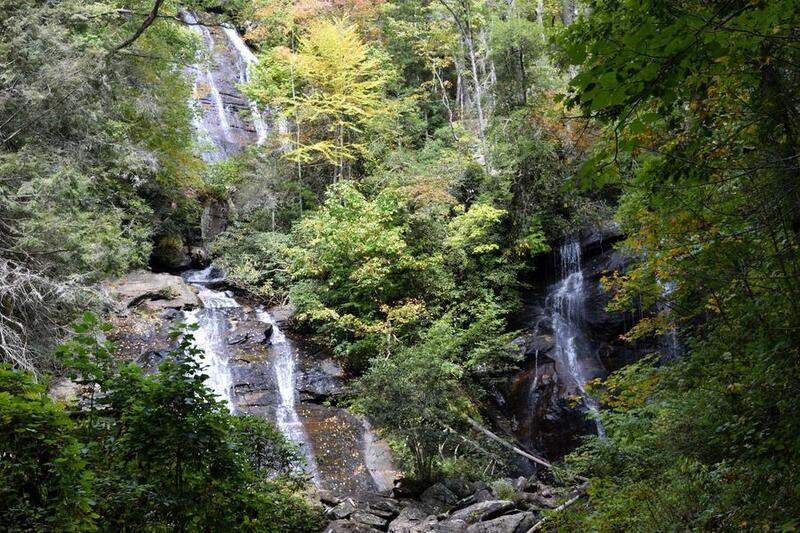 Like Dukes Creek Falls, this hike is located west of Helen on the Richard B. Russell Scenic Highway. If you intend to visit Raven Cliff Falls, you’ll want to check out our planning article for making the most of your trip. Starting up in Maine, the historic Appalachian Trail winds through 14 states and covers more than 2,000 miles before reaching its southern terminus in northern Georgia at Spring Mountain in the Chattahoochee-Oconee National Forest. The trail includes nearly 80 miles in Georgia. Serious and dedicated hikers can start their Appalachian Trail trek here and head north. Curious onlookers can reach the trailhead via Forest Service Road 42 near Amicalola Falls. Those in between can hike about nine miles from the Amicalola Falls visitor center to the Springer Mountain site. Anyway you get there, seeing this historic site is worth the effort. The portion of the trail in Georgia is mostly well-graded and has a difficulty level of easy to moderate. However, the further north you go, the more likely you will be to run into more difficult terrain. If you're hoping to backpack for a night on your mountain vacation, consider the 14-mile hike from Blood Mountain to Cowrock Mountain along the Appalachian Trail. Access is at the Byron Reece Trail on GA Highway 19, north of Cleveland. This is an ideal hike for an overnight adventure and provides some of the most pristine mountain vistas in all of North Georgia. For a full day of hiking and exercise, head to this 8.5-mile trail in Amicalola Falls State Park. You'll start at the base of the falls before climbing the falls corridor, scaling 604 steps the top of the waterfall, and proceeding onward into the wilderness. This hike is extremely beautiful but also very rigorous. A short 1/3 mile path, this trail offers some of the most incredible views of Amicalola Falls, As the tallest cascade East of the Mississippi, this is not to be missed. This path is handicap accessible, but you may choose to proceed on to climb up several hundred stairs to a viewing platform or climb all 604 steps to the top. When hiking just is not enough, you can try the fitness trail. The wooded path features more than 20 exercise stations. For a longer day trip out of Helen, head west to Cloudland Canyon, located in the western corner of the state on Georgia 136. The Cloudland Canyon State Park boasts five distinct hiking trails ranging from two miles round trip to nearly 12 miles in and back. Many consider this park one of the most scenic in the state because of its rugged geology. The park straddles Sitton Gulf Creek and trails can take you either around the rim for a peek into the canyon or even take you down to the canyon floor, covering more than 1,000 feet in elevation. You will be able to enjoy views from the peak of the canyon or from the canyon floor. Be sure to take the supplies you need for the longer and more strenuous hikes here and plan for a long day trip from Helen. This Park is located at 122 Cloudland Canyon Park Road, Rising Fawn, GA. This park, known primarily for its fantastic fishing, has a hidden gem. Smithgall Woods boasts five miles of nature trails for hikers looking to explore the woods in and around Helen. The park sits just three miles west of Helen on Georgia 75. The park has another 23 miles of roads and trails open to cyclists as well. Choose a leisurely half-mile stroll to get a look at the scenic Dukes Creek or a hike that interprets the gold mining past of this region, complete with a look into Martin’s Mineshaft, now a habitat for bats. Another hike takes you right through Dukes Creek, a unique way to explore the woodlands surrounding this waterway. Smithgall Woods is located at 61 Tsalaki Trail, Helen, Georgia. This easy 1/3 mile hiking trail is more about the experience than it is about the exercise. The short path will take you over a small tributary of Dukes Creek and an expansive, beautiful pasture. The trail also features a Florida Torreya planting - and extremely endangered tree in North America. The trail will appeal to the romantic in you as there are several adult swings where you can enjoy the scenery and each other's company before sitting down to a quiet picnic for two on one of the trail's picnic tables. This path is located adjacent to the visitor center and is of more moderate difficulty. You can request a free interpretive brochure from the visitor center prior to embarking on your hike so that you can learn about the various points of interest along the 1.6-mile loop trail. If you would like to check out a waterfall while hiking, be sure to head down the Cathy Ellis path. This is a memorial trail that is of moderate difficulty. The path will lead you to a gorgeous waterfall on what is referred to as the "Alabama Branch". You will cross a short wooden bridge that passes over a historic section of water that is related to the gold mining history of the Helen area. Smithgall Woods is home to this fun half mile loop. It's a fairly easy hike that will take you past a beaver pond and onto a boardwalk where you can watch various waterfowl at play, and search for frogs with your children. If you're really interested in these fascinating amphibians, be sure to stop by the visitor's center before hiking so that you can obtain a copy of "The Frogs of Smithgall Woods" guide and learn how to identify frogs by their distinct calls. Another Smithgall Woods path, this rugged 1.5 mile (one-way) trail makes hiking Helen, a lot of fun. Not only will hikers get to experience the beauty of Dukes Creek and expansive Georgia woodlands, but also features a covered bridge. Toward the end of the hike, you will need to ford/wade through Duke's Creek. The trail has been rated as "easy to moderate" in difficulty, so is suitable for less experienced hikers or families with children, and the wooded area is filled with native wildlife like deer and foxes. During the one mile loop, you will cross a wooden bridge that will take you across Duke's creek and to a vertical shaft that stands as a part of northern Georgia’s gold mining history. This spot is well known as a bat habitat, so have your camera ready to snap a photo as these winged creatures hang upside down to sleep by day. If you choose to hike at dusk, you may be able to score a shot of one or more bats in flight. Taking a stroll in Smithgall Woods is a favorite of locals and visitors alike for hiking around Helen. The park allows guests to explore five miles of nature trails which will be sure to give you a whole new look at Helen. There are trails that will give you a scenic look at Dukes Creek, or that will even take you through Dukes Creek in order to check out the woodlands which surround the waterway. Off Georgia 17/75 and just six miles outside of Helen, this hiking trail is approximately two miles long and follows an old logging road so the terrain is even and navigable for younger hikers. The trail follows Andrew’s Creek, also known for its trout fishing. You’ll see large yellow poplars, maples, oaks and along the stream, rhododendrons, and mountain laurel thickets along the trek. This is yet another great spot for Hiking during the fall months. The path passes through majestic Maple and Oak trees which are well known for their fabulous colors during autumn, and as you watch bright red leaves reflect in and float down Andrew's Creek, your breath will be taken away. Following a series of waterfalls, this hike is a popular, easy hike in the Chattahoochee Forest. At only 2.6 miles this short hike is perfect to pair with a longer hike or a great way to spend a morning on your North Georgia vacation. There are viewing platforms at various places along the trail so you can stop and enjoy the majesty of the waterfalls. Access to the trail is off of Forest Road 283 near Unicoi Road; not far from many of the cabin rentals in Helen. 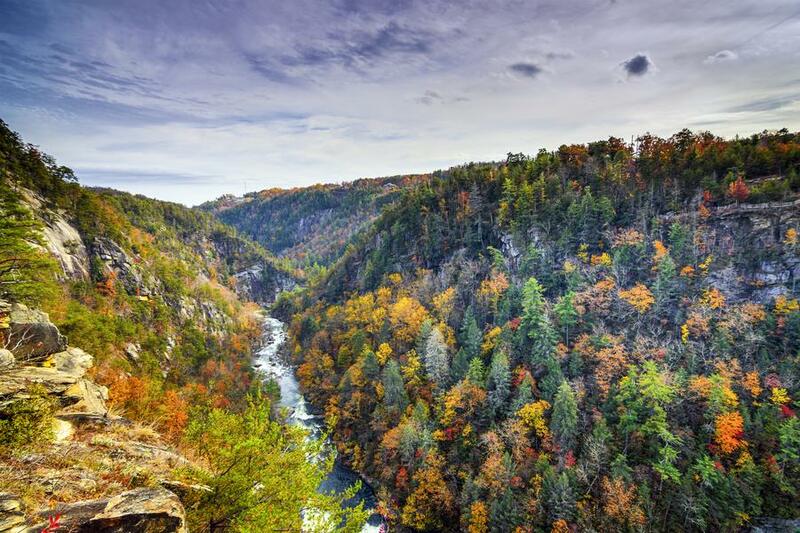 At two miles long and 1,000 feet deep, Tallulah Gorge is sizable canyon with incredible views. Although there are numerous rim trails, getting to hike the floor of the canyon is quite the experience. To reach the bottom, most hikers take the 600-step Hurricane Falls Staircase and simply enjoy the views, although extreme adventurists may also choose to proceed onward down a 2.5 miles round-trip trail that is extremely rugged, filled with rocks and boulders. Be advised that dogs are not allowed on the gorge floor or the stairs and that you must obtain a free access permit from the Interpretive Center. In order to get a permit, you must be wearing proper footwear, meaning no flip-flops, sandals, or crocs. Only 100 permits are issued each day, so it's wise to arrive early during peak season. This is one of the last wild and scenic rivers left in the United States and very well worth the visit. 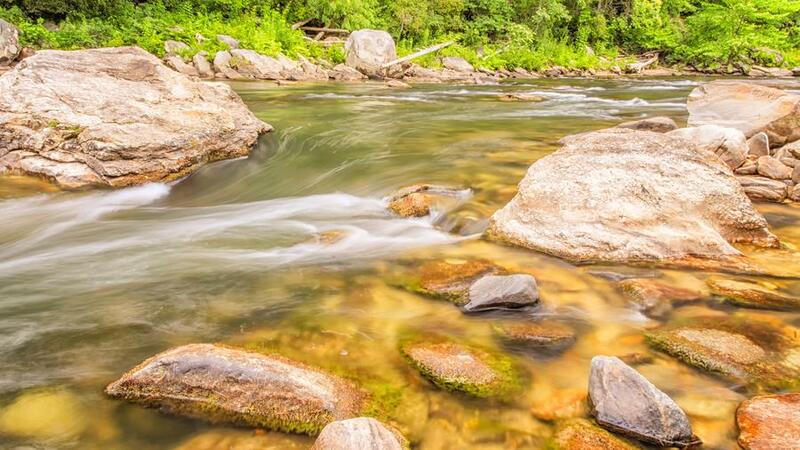 The flow of three streams creates the headwaters of the Chattooga River. This area is full of wildlife and includes incredible scenery. The hiking is phenomenal and can be a bit demanding at times depending on the trail that you choose. This state park is situated on the shores of Lake Burton near Clarksville in the far northeast corner of Georgia. A 2,800-acre park, Moccasin Creek State Park offers visitors a wide range of fun outdoor activities and several great hikes. A two-mile long trail, Hemlock Falls is an out and back trail that follows an old railroad bed. The trail used to connect easily to the Hemlock Falls waterfall but hurricanes and snowstorms have toppled trees, making it difficult to reach the falls. Experienced hikers may choose to navigate the fallen trees to reach the falls but should proceed with caution. Along the trail, hikers will hear the ever-present babbling of the river while they advance toward the falls. It is rated as an easy trail with minimal elevation gain. Perfect for children, this interpretive trail is flat and provides a wildlife observation tower. Kids and adults alike will be able to enjoy the outdoors while learning more about the wildlife that calls North Georgia home. Located in the Chattahoochee National Forest, Fort Mountain State Park offers visitors a unique mix of both pine and hardwood forests and expanses of blueberry thickets. This blend of foliage provides beautiful scenery throughout the year and creates an incredible canopy to hike under. The park boasts an 885 foot stone wall believed to be constructed by ancient Indians as part of their religious ceremonies. One of the best characteristics of this hiking trail is that it can be accessed from a variety of places in the park including the cottages, picnic areas, campgrounds, and the Big Rock Trail Parking area. Visitors are encouraged to hike the 1.2-mile loop in a counterclockwise direction which provides the most accessible trail. This 8.2-mile trail winds around the edge of Fort Mountain Park and is rated difficult to strenuous. Although the trail is scenic with amazing views it is also a very challenging hike. Seasoned hikers wanting a challenge while hiking Helen, GA will not be disappointed with this trail that runs just below the summits of Fort Mountain and Cohutta Mountain. In the north Georgia mountains, you can find numerous trails that offer stunning scenery, quiet surroundings and a variety of difficulty levels. 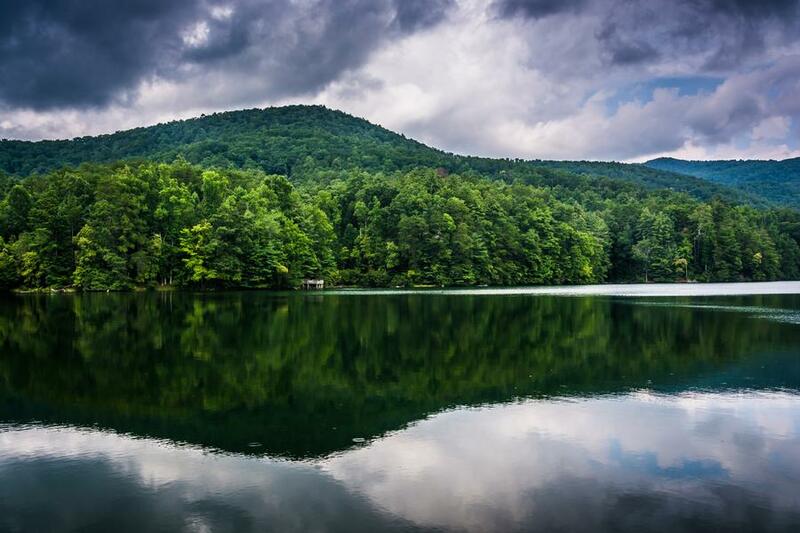 To prepare you for your next running adventure, here is a runner's guide to Helen GA. When planning a run, it is always important to know what the weather conditions will be and what you may potentially run into. Here is a break down of what to expect throughout the year in Helen GA. If you are heading to Helen in the Spring be sure to bring rain gear, especially in April, which is the rainiest month of the year. The temperatures typically range from highs in the low 70s to lows in the 40s. However, these temperatures can be lower if winter decides to linger around. Therefore, in addition to a rain jacket be sure to wear layers, so you can remove and add clothing as needed. You can enjoy warmth and sunshine during the summer months. The temperatures are pleasant with highs in the 80s. During the evening hours, the temperatures usually drop to around 60 degrees. If you are running during the day a pair of shorts and a t-shirt should suffice. You may also want to bring along a rain jacket, so you are prepared if you get caught in a thunderstorm. Autumn is a nice time for runners. The weather is typically dry with temperatures in the 70's during September and October. With this calm weather, you should be comfortable with a pair of running pants and a t-shirt. However, as you approach November when the temperatures drop into the low 60s it may be a good idea to bring an extra layer of warm clothing, especially if you will be running in the evening. In the winter be sure to bring warm clothing and well-insulated running shoes. Although some winters receive more snow than others, one thing is for sure. The temperatures will be on the chilly side. The highs are normally in the 50s but drop into the 40s come January. The nighttime hours bring in the coldest temperatures averaging in the mid-20s. Don’t forget to take plenty of water and good food on your trip. It always tastes so much better in the mountains anyhow. It is important to keep your carbs up and stay hydrated while hiking. You may get caught up in the amazing landscape and environment and forget to drink. Also, wear comfortable socks and hiking boots that are well worn in. Take a rain jacket that you can stuff in your backpack and maybe even a little fleece as a storm can and will roll in quickly in the mountains. Completing a hike is an incredible experience. As a visitor to the trails please follow basic safety and etiquette guidelines to ensure you're doing your part to maintain the majestic outdoors. Always stay on the trail. Be careful not to venture off into unmarked land and avoid shortcutting the switchbacks. Enjoy observing and photographing, but don't collect or pick up items you encounter. Walk quietly and travel softly. Remember that this is a home for living creatures and as a hiker, you are their visitor. Bring along a litter bag to pack out meal scraps or other waste. Visit the ranger station or visitor center at the trailhead to learn about current trail conditions and updates. Dress appropriately and wear proper hiking shoes. Bring extra layers with you in case of rain or changing weather conditions. Bring your own water and make sure to pack a small first aid kit. Have you ever had the opportunity to run up a mountain trail in an early morning fog while the spring leaves and flowers are budding? Traversing the mountain ridge you feel the chilled air in your lungs as you breathe deep within your chest. As your feet gently glide across the rocks and leaves you realize that this is like no other experience. One of my favorite places to trail run is in the mountains above Helen. I have found that the air is clean and the trails are smooth. This type of running is very different from pounding the pavement not only because of the scenery but also because it tests your focus and strength on a whole other level. Looking out for roots and rocks in the path is very important and it forces you to stay present on the few steps in front of you instead of looking way out in front and getting sidetracked. This sport is very challenging because the downhill sections of the run can be just as difficult as the uphill. The feeling of passing closely by trees and ducking under limbs while navigating the trail keeps you on your toes. The random log jump can be a blast as well. There is always a new obstacle or wild animal to encounter! I will never forget running up a mountain ridge only to crest the other side with full-grown black bear feeding only fifty feet down the slope. I quickly traversed back down the ridge with an intense adrenaline rush. My goal was the reach the top and now that I had been "spooked" if you will, I was quickly bounding down the path towards safety. Then the thought came to my mind that I might spook a mountain lion as I was literally letting my body float down the mountain path just by lifting the front of my feet slightly and letting my knees brace my fall. This was an adventure I will never forget and the trail run is always different every time I go. There is something very special about running under a canopy of hardwoods with all of the green foliage and planting each step on the soft soil underfoot. One trail in particular that reminds me of this setting is Blood Mountain. The sight of an incredible view will motivate many to trail run up a steep climb and this is exactly what drives me to the top of Blood Mt. It is the tallest peak on the Georgia section of the Appalachian Trail and not far from Helen Ga. To be in the type of shape that it takes to run uphill for several miles is exhilarating. The best section to run in my opinion in from Neel Gap. It is about two miles from this location to the top of Blood Mt. It helps that there are many switchbacks on this steep terrain and allows one to catch his or her breath while advancing up this climb. There are quite a few sections where rock covers the trail and you have to hike up over the challenging surface. Even though this trail is rugged and demanding the endorphins and view at the top are totally worth the effort. Make sure to book a nice night at one of the many Ga cabin rentals that include a hot tub to soak in after an intense trail run like this. It is also very important to run with plenty of water because there are few places to fill up on this route. A light jacket tied around your waist is a very smart idea as the temperature is sure to drop with the higher elevation and you never know when a storm is soon to roll in. Trail shoes are a must and I prefer Saloman's as they have a solid sole with great grip even on slick rock and mud. I would also suggest getting gore-tex for your trail shoes. I know some people who insist on using gaiters that keep rocks and other debris from getting into your shoes while running. It is a waterproof and breathable lining within the shoe that keeps water out but still allows your feet to get air. A good hat that is breathable and keeps the water off is another essential. Most of all before you head out for an epic trail run make sure that you are in shape enough to make the climb. Conditioning is key and the last roadblock you want to encounter is fatigue. Enjoyment is part of the game even when it is very challenging. Know yourself and your limits before you set your sights too high. Your shoes are a very important component and make sure that you have spent enough time in them before you go after a long climb because your feet will undoubtedly pay the price afterward if not. Socks are key too and my favorites are Smartwool socks. Especially for a grueling hike like Blood Mt. I would not suggest running alone. It will be much for fun with someone else and safety should always come first when striving for this type of accomplishment. Have you planned your next trail run to the North Georgia Mountains? We, on the other hand, decided to do an overnight backpacking trip to the headwaters of the Chattooga and it was far from easy, but we had one of the most memorable hiking and fly-fishing trips thus far. We spent much of our time bushwhacking to get to our camping location and it was so worth it. The water in this river is cold and crystal clear. The multiple species of trees rise high up in the sky and the whole area has such spectacular natural beauty. The headwaters of the Chattooga River run through Forest Service lands. As it finds its way down the old-growth Hemlock forest, there is a trail system by its side that goes for miles. The fishing is at its peak in the spring and fall, but even as we experienced summertime produces some great days on to catch trout while fly-fishing. It should be noted that the Chattooga is a very technical river. Deep pools, fast narrow runs, and wide slicks require a bit of skill to fish effectively. In the location that we fished in there were not any wide portions, but definitely narrow portions with fast moving current and difficult wading conditions. Overall this river is moderate in its wading requirements, though there are some areas that you will just have to climb around. I would suggest bringing felt soled waders with cleats and if you are an avid fly-fishermen then check out Patagonia’s river crampons they are perfect for this river. As with all wild trout waters, covering ground is essential. There is a trail that runs alongside the riverside for most of the upper stretch and is quite strenuous to navigate. At times, it is high on a ridge, but the trail connects the Bullpen trailhead with the Whiteside Cove Road trailhead. If you are willing to walk it, it almost never fails that you will find yourself alone on the stream. On our trip, we were alone the entire time along with our friends and it felt like we were all in the middle of nowhere just enjoying the hiking, wildlife, and amazing native fish. This area is somewhere that you will want to see when visiting North Georgia Cabin rentals and can be explored within a day’s trip. There are many other hiking areas nearby, but I am always drawn to the trails on beautiful streams where if you want to stop and fish or just sit by the water you can do so at any point. Hiking the wilderness parks of North Georgia is a wonderful compliment to your next getaway vacation to Helen. The parks offer a variety of trails and incredible scenery to enjoy. Venture out on a new trail and enjoy the beautiful views and gorgeous terrain of northern Georgia. Whether you are an experienced hiker or just starting out, there is a trail waiting for you. 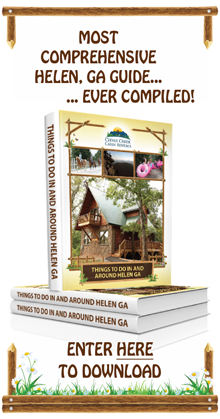 If you're planning a trip to Helen, consider letting Cedar Creek Cabin Rentals make your stay more comfortable and memorable. We have dozens of cabins in the area surrounding Helen, Georgia. Our mission is to provide you with a comfortable and luxurious home away from home. In the morning, you don’t have to cook your breakfast over an open fire. Instead, prepare a tasty meal in the full kitchen of your beautiful cabin rental. After a hearty morning feast and a couple of relaxing hours on the porch, you’ll be ready for another day of hitting the trails or, in some cases, shopping, horseback riding or beer and wine tasting. After all, Helen has activities and entertainment for all walks of life. Comment below about your hiking tips for the North Georgia area below. Here are a few questions to get you thinking. Which of these hikes are you looking forward to on your next North Georgia vacation? Which trail near Helen GA will you venture out to first? What is your favorite activity in the great outdoors?